Another stingray fishing trip at the Maeklong River in Thailand saw Tim Webb and his pal Andrew in search of River Monsters. The anglers began the morning with a quick breakfast followed by a bottle of chang beer. Soon the anglers were fishing a previously productive big fish area of the tidal river waiting for the water to reach its optimum level. With the water levels looking perfect for a bite, the floats remained lifeless with no action. A move downstream saw the anglers once again fishing again. A slow take on one of the floats soon developed into a run. As the angler wound down into the unseen fish it was soon apparent a stingray was not the culprit. 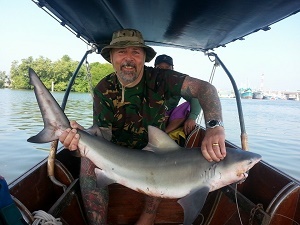 A short but spirited battle followed before a lively Bull shark of an estimated 10kg was boated. The anglers continued fishing for stingrays well into the afternoon but failed to land anything else except for small Bull Sharks in the 10-15kg range.